President Bush’s last ditch effort to save his two state vision will reach a climax with his visit to Israel and the West Bank this week. The President must have shivered in his boots as he read some of the welcoming statements that were published in the Jerusalem Post last week [“PA official says Olmert must be living on a different planet” - 2 January] - obviously made with the President’s imminent visit clearly in contemplation. First there was an anonymous spokesman for PLO Chairman Mahmoud Abbas stating that Israel’s Prime Minister Ehud Olmert “must be living on another planet. Peace and settlements don’t go together. If this is his policy , he can forget about finding a partner on the Palestinian side”. This unidentified informant made no bones in stressing that all settlements “are illegal having been built on occupied lands belonging to the Palestinian people". President Bush needs to repudiate these utterly outdated and irrelevant statements in clear and unequivocal terms for they have no place in the two state solution the President has been championing for the last four years. 1.Such a State cannot and will not be established in the whole of the West Bank. 2.Part of the West Bank will come under Israel’s sovereignty - the territory involved to be determined in negotiations between Israel and the PLO. Such territory will include already existing major Israeli population centers. 3.The PLO will have to abandon its demand that millions of Arabs be allowed to go and live in Israel and will have to resettle them in the new State to be created. 4.There will not be a full and complete return to the pre-1967 borders - or more correctly the pre-1967 armistice lines that were established between Jordan and Israel. 5.America is strongly committed to Israel’s security and well-being as a Jewish State and the PLO need to root out the cancer that sees the PLO leadership continuing to deny the existence of Israel as the Jewish State. President Bush does not have to be shy or timid in laying these conditions down as essential prerequisites for any further negotiations to continue. He has invested a lot of time and prestige in trying to bring his two state vision to fruition - only to be constantly rebuffed by an intransigent and recalcitrant PLO that has continued to ignore the President’s prescription for bringing yet another Arab state - the 23rd - into being. Last week’s outburst by leading Palestinian spokesmen clearly indicate that continuing negotiations are a complete waste of time unless President Bush’s “five articles of faith” are accepted clearly and unequivocally as the basis for further negotiations. 1.The West Bank does not belong to the Palestinian people. 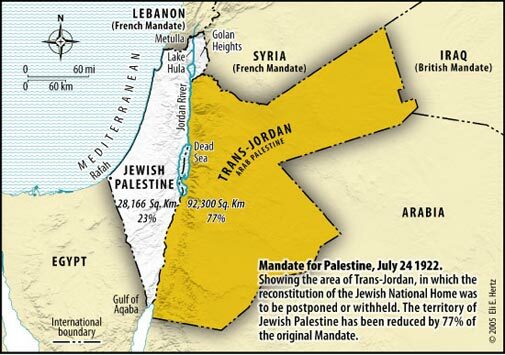 Israel has claims to the area under the League of Nations Mandate for Palestine and the United Nations Charter. It is disputed territory to which both Jews and Arabs have competing claims. 2.Jews have the legal right under the Mandate and the UN Charter to settle in the West Bank for the purposes of reconstituting the Jewish National Home. Construction work by Jews there is not illegal. 3.The West Bank is the only area of former Palestine where sovereignty remains unallocated between Arabs and Jews. The Arabs already have one State which possesses complete and unfettered sovereignty in 78% of former Palestine which is today called Jordan. 4. Continued unwillingness by the Arabs to share Palestine with the Jews over the last 90 years has seen the territory available to the Arabs continue to diminish. The chance now offered by President Bush to end this sliding disaster will not return if it is rejected by the PLO. The failure by the PLO to acknowledge these realities might well lead President Bush to conclude that it is the PLO that is off the planet and that perhaps the only way it will ever get its State is by establishing it on another planet. That is not rocket science - only plain old fashioned commonsense.